The great American writer and 1949 Nobel Prize winner for Literature, William Faulkner once said of the past, “History is not was, it is.” Having lived through two world wars, the great depression and hailing from the deep south of the USA he had seen more history than most ever will. But he was always well aware never to believe one’s own hype nor unchecked bold claims. So while Honda, Ducati and Aprilia have used V4 engines to great success in MotoGP and WSBK with supreme technological achievements, you have to go back to the dark times of the Great Depression to find their inspiration. And this is it. 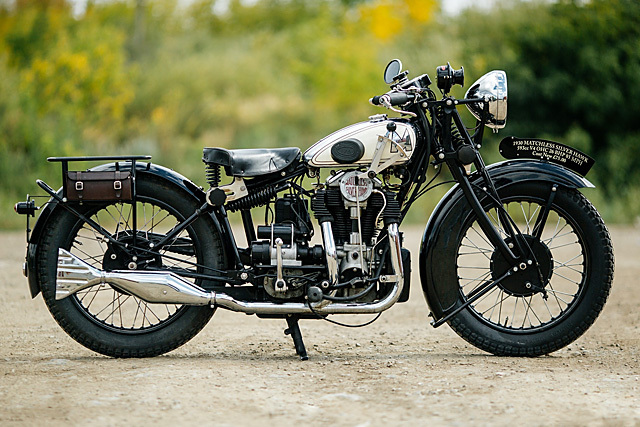 The Matchless Silver Hawk, a V4-equipped motorcycle introduced to the world at the 1930 Motorcycle Show in Olympia, London. So where did we find such an incredible example? In the Motos of War collection from our great friends in Russia, The Motorworld by V.Sheyanov, of course. For a number of years Matchless had tried to come up with innovative new engine designs, something that would give them both a mechanical advantage and a new marketing tool. While business rolled along with their main fleet of machines their top-tier premium models just weren’t quite right. 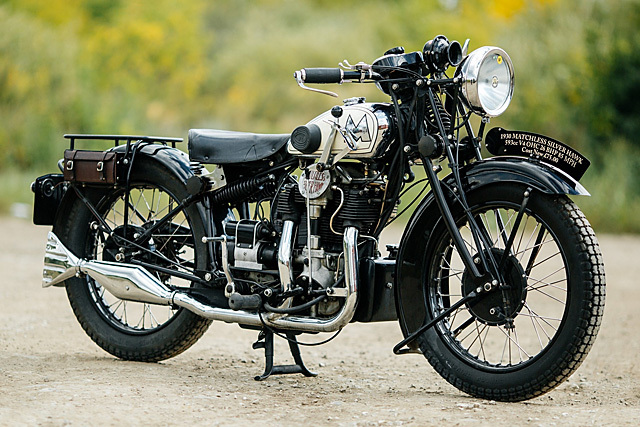 The 397cc V-Twin fitted to the Matchless Silver Arrow was a unique unit of that there is no doubt, the technology innovative for the time, but overheating problems, busted gearboxes and being as slow as an old sail boat is not acceptable for a premium product. The Silver Arrow was the work of racer Charlie Collier, but it was his brother Bert who put pen to paper and came up with the design for the incredible V4 that would be fitted to the Silver Hawk. 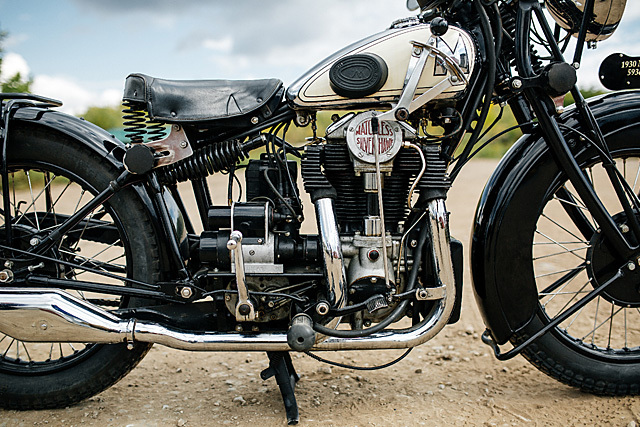 Rather than change too many components from the earlier Arrow he instead focussed on the engine and arrived at the Motorcycle Show with only one other four banger on display, the legendary Ariel Square Four. There was just one problem, the Great Depression was beginning and nobody could forecast that it would last so long. Both the Ariel Square Four and Silver Hawk were terrific motorcycles, however only one could survive with prestige motorcycles a hard to sell commodity during such times. It was the Ariel that would cling on longer, but this particular Matchless didn’t come straight from the big show, get wrapped in cotton wool for decades and then land in the hands of the Motos of War. 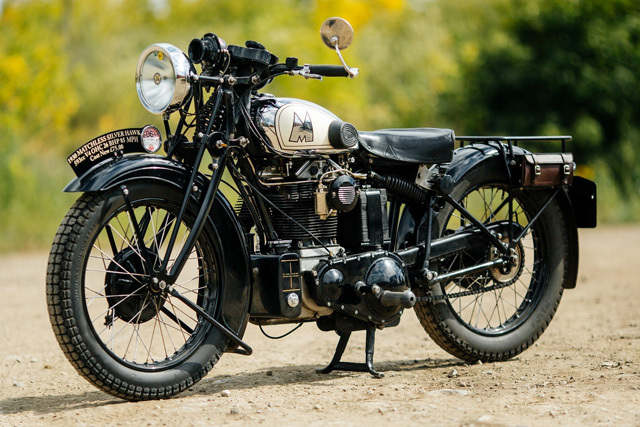 Instead it comes courtesy of a full restoration from one of the great men of inter-war Matchless and AJS motorcycles, Pat Gill. 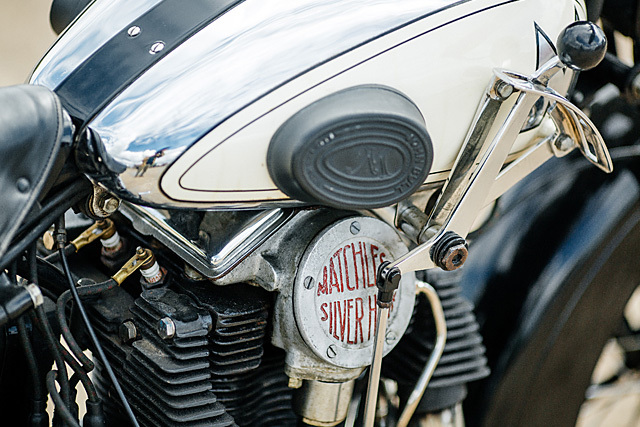 When Pat got his hands on the 1930 Silver Hawk it was a rusty pile of scrap, but being the brilliant restorer he is, letting this historic icon remain that way was never an option. So after ten years of finding the parts for the build and another three years spent of hard graft he’d built himself an amazing example of the original Silver Hawk. It’s almost impossible to discuss the Silver Hawk without constantly coming back to that engine, 592cc of air-cooled V4 with a dry sump that featured a fabric oil filter. The inner workings also had their charms; the single overhead cam ran across the cylinder head, driven at the right-hand side by a substantial shaft and bevel gear arrangement. 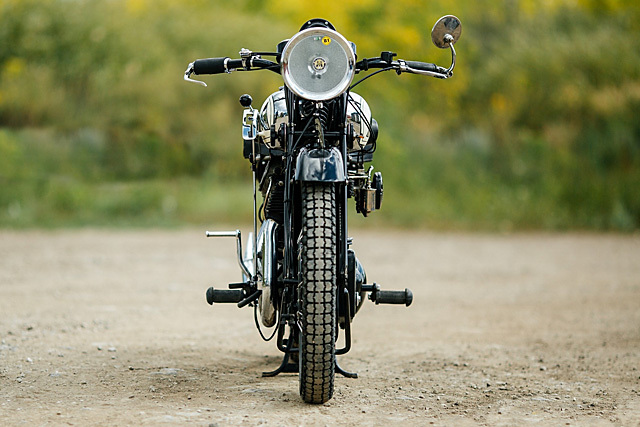 The four cylinders had a measured bore and stroke of 50.8 x 73 mm producing an adequate 26hp but so much torque that the bike could be ridden in top gear without ever needing to shift. 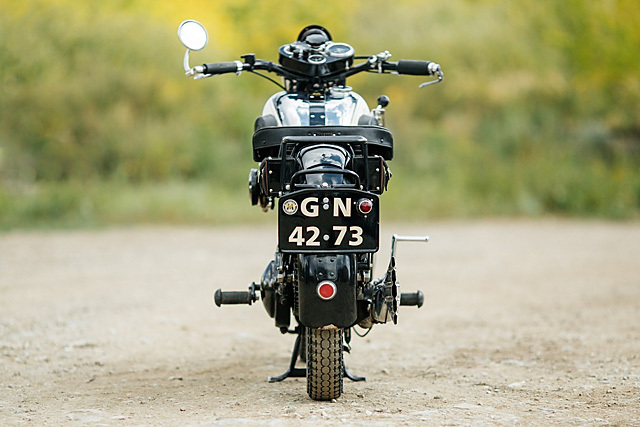 From as low as 6mph the rider could slot the new Four speed Sturmey Archer Gearbox into top gear and keep it there all the way to a top speed of 85mph. Such tractability is almost unheard of in 2016 but the Amal fueled engine with Lucas dynamo ignition could do it all day long. 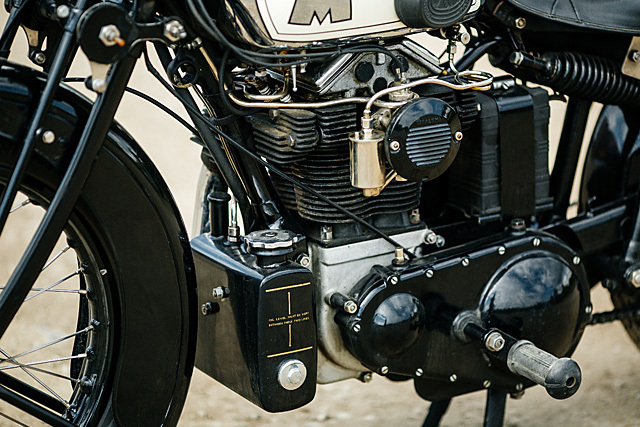 That incredible engine was bolted into a frame that it truly deserved, the Matchless marketing material describing the combination “as unquestionably the most fascinating machine to ride that has ever been built. It combines the silence, smoothness and comfort of the most expensive motor car with a super-sports performance.” That smooth ride was largely due to Matchless using a sprung rear end attached to the brazed lug tubular construction frame. The rear cantilever suspension was not unique on the market, but with rigids still dominating it provided the level of build quality and sophistication that a premium bike so richly deserved. Towards the front of the frame was a pressed-steel tank at the base of the front-down tube that held the oil for the engine. While at the top of that same down-tube swinging through the headstock was a Matchless centre spring girder with finger adjustments for an excellent level of feel through the front suspension. The final piece to the refined handling puzzle was mounted below the sumptuous black leather (also available in tan) seat, two springs to support the rider that could be adjusted on the fly with neatly positioned dials. 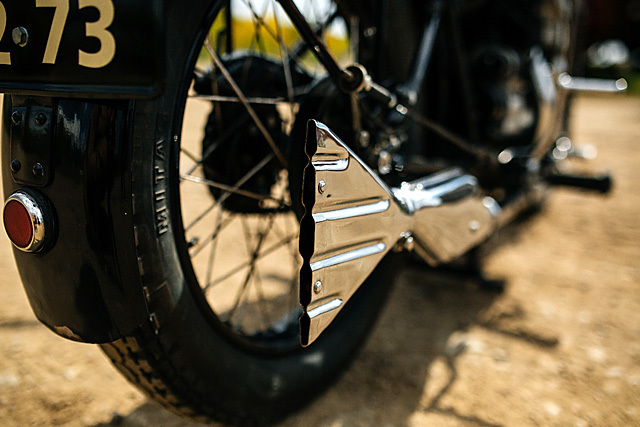 If the suspension was ahead of its time the braking was pure 1930s in the form of 8″ drums front and back. Although they did offer one unique touch, interconnected at the brake pedal both front and rear could be applied simultaneously while the brake lever operation just the front. These formed the hubs for the steel spoked rims, 3.25 x 19″, front and rear with the option to spec it up to 4″ rims should you desire the wide tyre look. For all the technology Bert Collier packed into his design he also ensured it looked beautiful too. 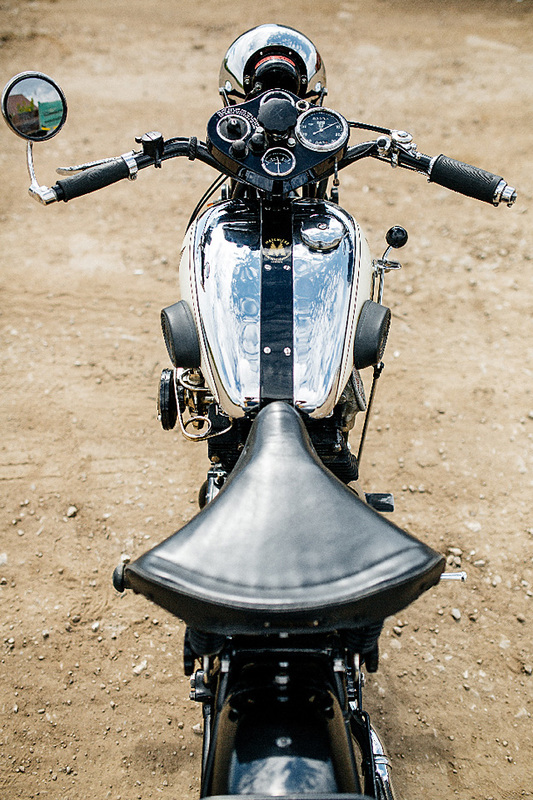 The front fender starts like a typical design and then slowly progresses reward in a swooping arc to become a full cover fender by the time it reaches the rear of the tyre. The rear item was just as beautifully crafted in the factory with almost complete tyre coverage to keep a gentleman’s suit looking prim and proper for his lady friend. A generous rack (minds out the gutter, please) perched behind the seat was well-appointed for the businessman or the weekend adventurer with expensive leather bags. But it was the tank and exhaust combo that really caught the eye; both had lashings of chrome applied with the body work getting white-painted side panels to reveal the famous Matchless “M”. 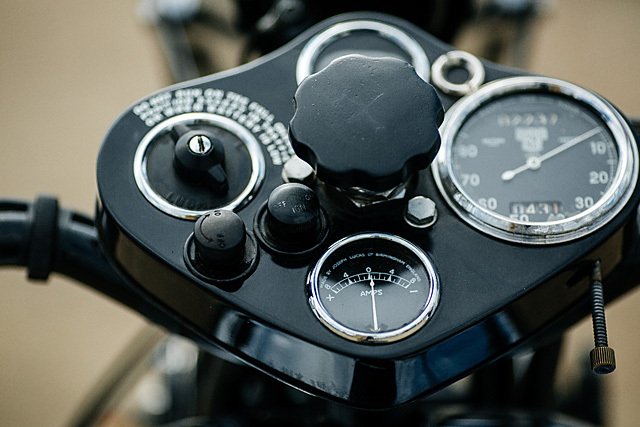 The dials too were all class, exactly what you would expect from a machine that sold for big money in its day. But it wasn’t to last, after four years of production the Silver Hawk was discontinued, the depression had emptied the pockets of even the richest playboys. Thankfully it was someone with the talents and skill of Gill’s who restored this machine or we’d never have laid eyes on a Silver Hawk this good again. Just how good? The new Russian owners explain “The result was very successful – for many years, Pat Gill with his Matchless Silver Hawk competed in a variety of gatherings, races and competitions, consistently winning awards. The British retro show in 2011, the motorcycle took 2nd place in the category “Best motorcycle pre 1950” and won the award for “Best British motorcycle” in 2012.” It’s also won a host of awards for “Most interesting technical model” and that is the charm of the Silver Hawk, it may have died an early death, but its technology is still captivating to this day. 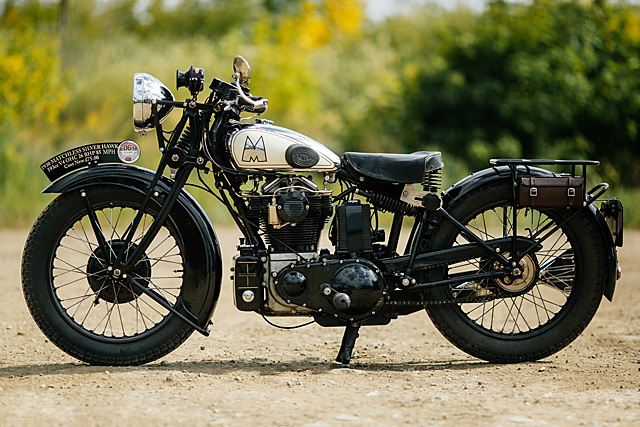 Pipeburn is organising a tour to “The Motorworld by V. Sheyanov” collection in Russia. It will be a once in a lifetime experience to a ride some of the rarest motorcycles in the world – and probably drink a little bit of Vodka too. If you would be interested in joining us shoot us an email and we will keep you posted on the details and costs.